Verify that your contractor is registered with the Commonwealth of Pennsylvania. On July 1, 2009, the Home Improvement Consumer Protection Act took effect. This law requires most home improvement contractors to register with the Pennsylvania Attorney General’s Office. Additionally, these contractors must maintain minimum insurance coverage and utilize contracts that comply with a number of consumer protection requirements specified in this law. The Attorney General’s Bureau of Consumer Protection is responsible for enforcement of these requirements. Ask if the contractor belongs to a builders association or a concrete trade association. Ask if the contractor has a current Flatwork Finisher’s Certification from the American Concrete Institute. Ask for references. Speak with others who have used the contractor you are considering. Always be wary of contractors who will not give references. Ask to see examples of the contractor’s work. Always insist on written contracts. Any changes to the original contract should also be in writing. Contracts should include warranties and guarantees on the contractor’s work. Be specific about the start and finish dates. However, keep in mind that some delays, such as weather, are beyond the contractor’s control. Allow 2 to 3 days for possible delays. Curing is the process used to maintain the moisture in freshly placed concrete and is essential for long term durability. Contractors will typically initiate curing by applying a film of curing compound to the surface of the concrete following its placement. The Contractor may opt to moist cure the concrete. There are several methods for moist curing, but the most common are continuous spraying/ fogging or a wet covering. Spraying/fogging can be achieved with an ordinary lawn sprinkler; if good coverage is provided and water run-off is not a concern. Soil-soaker hoses also provide excellent curing. If you choose to wet cover the concrete, a moisture-retaining fabric like burlap or cotton mats are recommended. They should be placed on the concrete as soon as it has sufficiently hardened in order to prevent surface damage. The coverings should be kept continuously moist and a film of water should remain on the concrete surface throughout the curing period (optimally for 7 days). Following curing, a period of at least one month of air drying should elapse to enhance the concrete’s resistance to scaling. After this drying period, a penetrating sealer can be applied for greater durability and resistance to deicers. Sealing your concrete will protect it and ensure its optimum life. For outdoor applications, film-forming sealers containing solvent-based acrylics are the best choice as these sealers allow easy escape of the moisture. A penetrating sealer should be applied approximately 30 days after placement and must be placed BEFORE the first frost. Make sure your sealer is capable of forming an impenetrable barrier to protect the concrete surface from corrosive materials such as salts and acids. Environmentally friendly sealers are available. Be sure to apply the sealer as directed by the manufacturer. Most sealers will wear with time and reapplication may be necessary. Always consult your contractor before applying sealers. Concrete that is subjected to deicing salts combined with freeze-thaw conditions are prone to scaling. Refrain from using deicing chemicals. Sand or sawdust can provide adequate skid reduction in place of harsh materials. Please see the PACA Product Information Sheet titled “Scaling” for more information on the harmful effects of deicers. It may be downloaded at www.specifyconcrete.org. Under no circumstances should a deicer be used on concrete that has not fully cured, particularly the first winter after it has been placed. While deicers are efficient in melting snow, they can play havoc with freshly placed concrete. We generally recommend that de-icers not be used in the first year of the pavement’s life, but even “safe” de-icers can cause scaling in the 2nd, 3rd or even 4th year. A typical de-icing agent may include: Sodium chloride (Table Salt) Calcium Chloride Magnesium Chloride Potassium Chloride Calcium Magnesium Acetate Urea, Ammonium Sulfate, Nitrogen Salts. While there are many types of deicers on the market, they all work on lowering the freezing temperature of water. There is a common misconception that concrete is relatively inert. Concrete, in fact, continues to cure and change properties as it matures. The use of these types of chemicals can significantly affect the concrete’s durability. If you have any doubt of their destructive nature, place a small amount of calcium chloride on a tin pan and observe what effect it has on the pan. Deicers tend to amplify freeze-thaw deterioration which can lead to surface defects and possible structural failure. It is in the nature of the material. Cracks are the result of concrete shrinkage, which may be approximately 5/8” in 20’. Knowledgeable contractors install contraction joints that encourage the concrete to crack in designated locations. Make sure to speak with your contractor about jointing. Choosing concrete for driveways, sidewalks and patios enhances the appearance and value of your home and requires very little maintenance. The most common materials used in home exterior flatwork are concrete and asphalt. At first glance, they seem quite similar. Both materials appear to give a smooth, solid finish. The similarities end there. Longer product lifecycle (30+ years) means fewer repairs or replacement. Concrete is environmentally friendly. Its production and placement are not energy intensive. Concrete pavements are “cooler”; their light color reduces heat retention. Lighter colored concrete pavements require less lighting to illuminate a given area. Concrete is considered a “rigid” pavement and can evenly carry heavy loads (trucks, boats, etc.). Resistant to oils and other petroleum-based liquids. Concrete can easily be constructed in a variety of shapes and colors. Requires regular sealing to keep the pavement flexible, increasing the overall cost of pavement ownership. “Hot mix” asphalt production and placement requires tem-peratures that exceed 200 – 250 degrees F.
Darker colored asphalt pavement absorb the heat and pro-duce greater surface and ambient temperatures. Darker colored asphalt pavement may require 33% more lighting for a given area than concrete. Asphalt is considered a “flexible” pavement and is subject to defects such as rutting and washboarding under heavy traffic. Easily deteriorated by gas, oil, anti-freeze and other com-mon chemicals. Asphalt does not offer a variety of creative construction options. 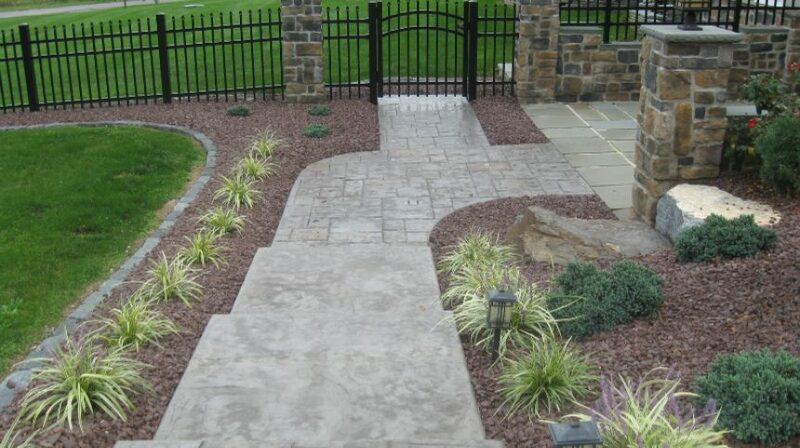 Homeowners also have a variety of color and texture options available to them by staining or stamping concrete. Staining the concrete will infuse it with any color you may choose. Earth tones are the most readily available, but there are other options. Exposed aggregate surfaces create a pavement with interesting colors and textures. Remember you can Count on Concrete!